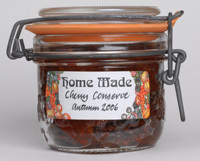 Countryside-Direct Self-adhesive Jar Labels add that finishing touch to home made jams, chutneys, pickles and preserves. Larger orders can be supplied at a discount, please ask for details. #4501 24 Herbs, #4502 24 Spices, #4503 24 Dry Goods, #4504 Matching plain labels.